Please give as much notice as possible to save being disapointed by other diary commitments. The Sacrament of Baptism is given by pouring water in the name of the three Persons of the Trinity. Jesus has told us that unless a man is born again of water and the Holy Spirit, he cannot enter the Kingdom of Heaven. It is through God’s action in this Sacrament that we become members of his Church and are adopted into his Family. Water is the symbol of life, and the life that we are given in Baptism is the life of Christ himself. We become new people and with God’s help we have to try to live a new kind of life. What you are requesting when you ask for your child to be baptised? Baptism is a very important step to take and it needs to be thought about carefully. It means much more than a ceremony in Church and perhaps a party at home afterwards. Being baptized means becoming a Christian and being a Christian is something that should influence the way you think, the way you talk and the way you behave every day of your life, Baptism means a life-long commitment to God. When a baby is baptized, the parents undertake to bring up their child to know and to practice their faith and the faith of the Church, until the child is old enough to gladly make that faith his/her own. What should this mean for the parents? As parents, you have given life to your child, but birth is only a beginning. Your baby still depends on you for everything, for food, for clothes and for a loving home in which to grow. This is equally true of the Christian life. Baptism is only the beginning. Human beings develop by being trained and the home is the chief training ground, the parents are the child’s most important teachers. Parents naturally pass on their language and their culture to their children – those who gratefully acknowledge the Christian Faith as part of their way of life cannot but wish to pass that on too. It is in the home, where the child first experiences love and a sense of belonging, that he will also learn about the love of God and learn to talk to God in prayer: He will learn, naturally, more from the example of the daily lives of his parents than from any formal teaching, the principles and the guide-lines of Christian living. When school-time comes, you will find that a Catholic School will help you to continue the education of your child. As well as the usual academic skills and crafts, the school will help you prepare your child for the Sacraments, and will try to deepen his/her knowledge of the Catholic faith and the morality that is already part of his/her life. 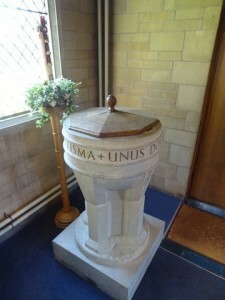 However, it must be said that the school is no substitute for a family where the faith is really lived and practised; a home where there is kindness, honesty and true Christian love, a home that recognises its need for God through prayer, through the Holy Mass and regular use of the Sacraments. In asking to have your child baptized, this is what you are taking on. It is not something to be accepted lightly. Think about it and talk about it with your partner. The Parish Priest will be glad to help you and answer any difficulties. If after that you are willing to accept the responsibility of trying to bring up your child in the knowledge of and practice of the Catholic Faith, then please complete the form and return it to the Parish Priest.